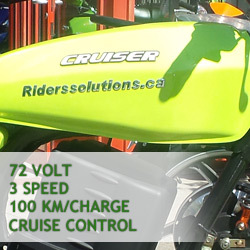 Welcome to riderssolutions.ca Where Electric Bikes & scooters has been our pride and passion since 2008! Over the years we have served thousands of customers all over canada helping them acquire their e- bike of choice. All of our E bikes are proudly designed by us and assembled by us in store with high performance compnents such as. Led lights, Cruise control, 3 speed Tubeless Tires, Disk Brakes Gas capsule rear shocks and much more!. Check out our different E bikes starting from 48 volt 60 volt, 72 volt and 80 volt. We also have a wide variety of mobilty bikes. Hawk, Ninja, RS80, Cruiser, King, Renegade & Mini are some of the best bikes on the market and all come with a satisfaction gurantee warranty. 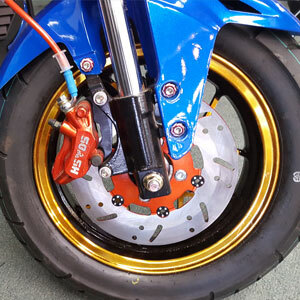 Top performance and Top quality of Electirc Bikes is what we are all about! As we are hamiltons best ebike shop, we are proud to serve Hamilton, Brantford, Burlington, Guelph, Missisauga, Kitchener and all of the GTA and carry other electric ebikes as well as replacement parts for our makes and models. If you need any part for your ebike, chances are we have it in stock, so give us a call and we can ship it anywhere in Canada, or you can pick it up. Please take a look at the ebike models on our website and give us a call if you have any inquiries, we would be glad to assist you. For men and ladies! We look forward to seeing you at Riders Solutions! 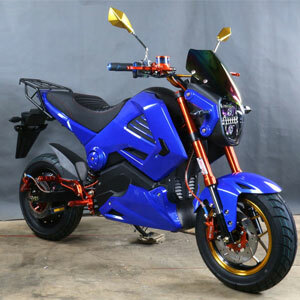 Ninja is 72 volt all electric bicycle. This bike looks exactly like a gas powered motorcycle but yes ALL ELECTRIC. Call Riders Solutions Today at 905.547.4747!